The inheritance and promise within Isaiah 55 is for every follower of Christ. Even though I have studied this passage repeatedly, I continue to glean new and fresh insights from this little portion. 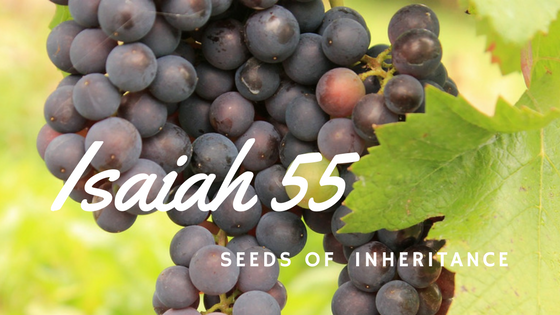 Isaiah 55 is like seed producing continuing harvest in my life. “Man can count seeds in grape! God uses the seeds of His written word, the bible, to speak directly to us regarding our identity and purpose. These seeds become our personal inheritance to absorb in faith. Isaiah 55 invites us to come, listen, see, seek and go. Invitations welcome us to one-on-one fellowship, business meetings, weddings, home groups, family reunions or larger gatherings; relationships are important. God designed us for relationship with Him and with others. Even introverts, like me, must resist the urge of solitude and embrace community. The only requirement is thirst! That is a good thing! We don’t need money; the expenses around this invitation have been paid in full. As a young girl, I would stand on the ridge of a coulee along the Qu’Appelle Valley and call, funneling the sound of my voice with small cupped hands around my mouth. The echo would resound again and again and again off the valley walls. Everything is ready just for you! Come quickly and linger long! The ability to come into God’s presence is part of the wonderful inheritance we have through Christ. We are welcome here with Him, our friends are welcome, so is our family, and wonder-upon-wonders, I am too! God is much more anxious for us to come and listen than we are to respond. Our hesitancy proves our doubt in His good character, His loving nature, and His desire to bless us. When you stop and think about it, this is an astounding verse. God is giving us the same promises He gave to David. 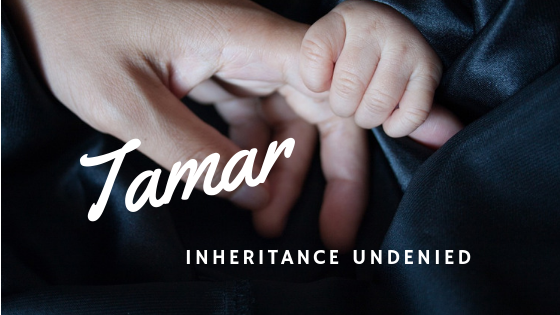 (II Samuel 7, I Chronicles 17, and Psalms 89) That is a lot of inheritance! Nonetheless, it is part and parcel of the covenant relationship we have with the God of heaven and earth, through our Lord Jesus Christ. God wants us not just to hear, but to grab hold of, this vision He has for us. We dishonour God by thinking small! His promise to us is international in scope! We each have a part to play in bringing the Good News to all nations. Because His splendor is within us, it also radiates from us. Endowed “with splendor” may mean promotion and honour. Receive them humbly and graciously. It is important to recognize every advancement is God’s inheritance for us. Let’s be sure to thank Him when our sphere of influence grows. These opportunities are less a reflection of us than of God’s goodness. Today is a good time to respond to God’s invitation to draw near to Him. It is arrogant to think we will always have this opportunity. Her life has been a progressive journey of freedom ever since, full of excitement, new friendships, and a sense of belonging and value. It is easier to go when we know we are being led! Our lives are not aimless; God is faithfully leading and sending. Even when we are uncertain of our direction, we need not fear. He continues to guide. In Christ, we not only go, we go in joy! God’s thoughts and ways are absolutely brilliant; we have no capacity to comprehend them. One thing is certain; God is good! In responding to His invitation to participate in our inheritance, we come, listen, see, seek and go, trusting in His excellent design. Life in Christ is a process of discovering His higher and better purpose. Today as we consider this one little portion of scripture, may we with new awareness go in all He has promised. In coming to Him, we go with joy! Moving and Change – Welcome or to be Avoided? If you have any comments on this or any previous blog leave them here!